Singapore may be paying $15 million to host the historic summit between U.S. President Donald Trump and North Korea leader Kim Jong Un, but at least the city-state’s hospitality and food industries stand to benefit from the big event. Local businesses in Singapore, which see the summit as a great marketing opportunity, hope to capitalize on the frenzy. The event has inspired businesses to add Trump- and Kim-themed offerings to their regular menus, from tacos to drinks. Lucha Loco, a Mexican restaurant in the city’s central business district, is offering two special tacos from June 4-16. The Rocket Man Taco, representing Kim, is made of Korean fried chicken, spicy dressing, pickled white radish and sesame. The El Trumpo Taco features a beef patty, melted cheese, lettuce, chipotle ketchup, secret sauce and pickles. Each one is priced at 10 Singapore dollars ($7.50 USD) and people can enter to win a chance to smash custom-made Trump-Kim piñatas. So far, the Rocket Man Taco is more popular than the El Trumpo Taco, and it’s not necessarily because people in Singapore like Kim more than Trump. “Taco with Korean fried chicken is more unconventional, so people want to give it a try,” an employee at the restaurant explained to Yahoo Finance. 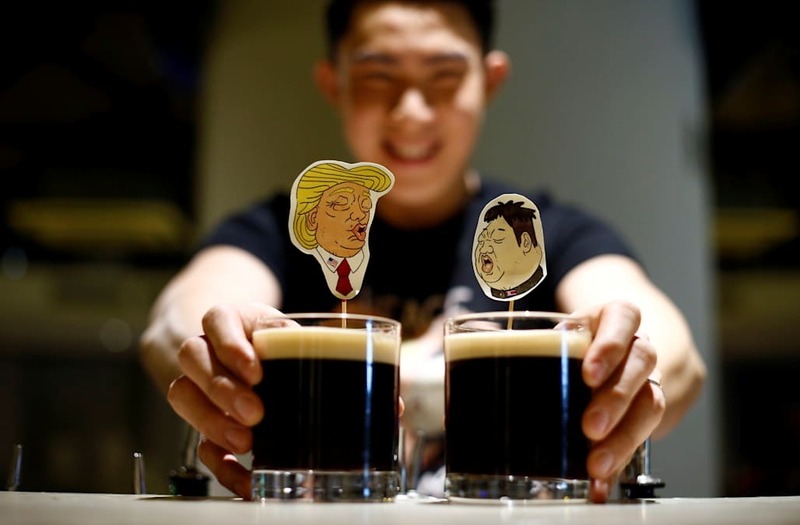 Escobar, also located in the city-state’s central business district, is making special drinks named “Trump” and “Kim” featuring different colors representing the two countries. “Trump” is a blue, bourbon-based cocktail and “Kim” is a soju-based, red drink. Each is priced at 12.60 Singapore dollars (USD $9.44), to represent the date of the historic summit. The owner said all delegates and media in town for the summit can enjoy their first drink for free. Singapore’s most popular newspaper, Straits Times ,even put together a list of “10 places to go for summit themed food and drinks,” which include Trump-Kimchi dry-aged beef nasi lemak, various forms of Trump-Kim burgers, Rocket Man tacos and El Trumpo burgers. Haresh Singaraju, a physician in Singapore, said he has seen the burgers and drinks in the news but hasn’t tried anything. He’s happy to see the increasing media coverage the city-state has received because of the much-anticipated event. Krystal Hu is a technology and economy reporter at Yahoo Finance. Follow Krystal on Twitter. Aarthi Swaminathan is an intern at Yahoo Finance. Follow Aarthi on Twitter @aarthiswami.